While the world of social networks is generally believed to be involving Facebook and Twitter only, there’s this whole other dimension, StumbleUpon that is equally beneficial from a business point of view. 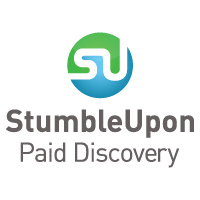 StumbleUpon is an online channel for discovering information from all over the internet, about your subjects of interest (set manually). With a user base of over 25 Million stumblers who are constantly looking for something new and exciting, it stands as a good platform for the advertisers. With the introduction of the Paid Discovery feature, its popularity and worth exponentially increased in the eyes of the content marketers because of the many advantages it has over other procedures. The Paid Discovery feature is something entirely different from the conventional advertisement campaigns since there is no advertisement actually displayed and so, you don’t need the user’s click. The users are directly stumbled onto your website at a higher priority than the free stumbles. The technique works the same way as the PPC (pay per click) mechanisms, but is more beneficial in multiple ways. One of them being the saving of your precious time you spent on designing an attractive advertisement so as to pull the customer to you since now, your content is directly pushed to the customer. You can also describe your content to be in multiple categories so as to touch a vast space. A maximum of 5% of stumbles are reserved for this Paid Discovery feature which makes your chances of getting hit on, more. Better Demographics and Targeting - The traditional PPC mechanisms don’t really focus on the demographics and focus on getting you the view only. However, this feature gets you the right type of audience you need on your website by providing you extensive targeting options. Paid as well as unpaid Visits - Parallel to the paid targeting, the free one is also operational and your URL will be stumbled upon by both, the paid as well as the unpaid visitors which would grow directly with your free stumbles that you earn from the paid service. Discovery Guaranteed - The problems with free stumbles it, you don’t know if someone will actually stumble upon it or not. The money eradicates this problem as you do get the viewer and that too an interested one and not just a ghost visitor (someone who comes and just moves on). Affordable - Paid Discovery is proven to be more feasible than marketing on Facebook and other such platforms and that is probably because of its lower pricing and higher success chances. The charges are $0.05 for basic, $0.10 for standard and $0.25 for premium stumbles. Tracking made possible - The normal stumbles cannot properly be monitored with any tool and from a marketing point of view, this is a great disadvantage of the feature. The Paid Discovery service can however be tracked in detail by the Google Analytics which makes marketing easier and simplified. Device based Traffic - Nowhere you get to choose the device your advertisement will run on and naturally it will run on every one of them. But if your website is not optimized for smartphones, you’re getting negatives reviews for sure. Paid Discovery offers you to select the device you want to preview your website on and it will be done that way. This new feature by StumbleUpon is proven to be a great success especially for kickstarters. While the other simple advertising mechanisms are also performing great, it’s always advised to try out a different set of patterns for your tasks and this Paid Discovery feature is exactly what you need. With a proper mechanism to deal with every little detail, it serves as the most effective tool of its type which is technically much better in features than the mainstream PPC and Facebook advertising, and it’s sure worth a shot since you got nothing to lose. Thanks bro! As usual your writing skills is unquestionable!